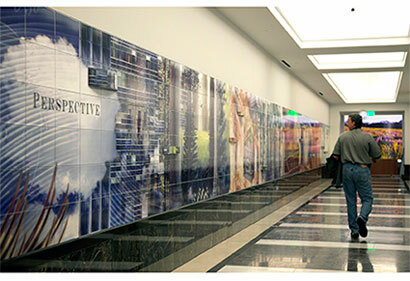 In Plain Sight art has evolved through the collaborative efforts of artists Brian Boldon and Amy Baur. Since 2004, both have invested the majority of their studio practice to understanding and pushing the technology of digital glaze printing. The studio offers a unique vision for integrating the digital image with architectural spaces. This intersection between traditional materials such as ceramics and glass, and the current possibilities available with digital imaging, creates an exciting, innovative resource for architects, designers, and artists. In Plain Sight art offers new possibilities for imagining materials, form, image, and the transition between interior and exterior space. 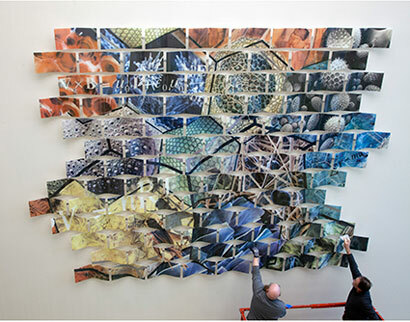 Though husband and wife duo Amy Baur and Brian Boldon earn public art commissions across the United States, their newest work, set to show in late 2013, will grace a 12-by-170 foot space in the newly renovated Union Depot in Saint Paul. The work centers on the use of digital images fused to glass and ceramics in a unique process Boldon developed and they perfected together. The result is striking tile and glass works with permanent, lasting imagery.